MAPUTO. – Fulai Joaquim has enough food to feed his 10 children for another week, maybe two. Then, he says, it is in the hands of God. A cyclone ripped his cassava crop from the ground, leaving the roots to rot in the field, and the floods that followed washed away his maize. Hundreds of rural communities were plunged into food crisis after Cyclone Idai tore through central Mozambique on March 14, humanitarian workers say. The government estimates that more than 700,000 hectares of agricultural land was flooded, leaving many farmers with nothing to harvest. From the air, the kilometers of flattened crops look like thinning, slicked-back hair. More than 750 people died in the storm and heavy rains before it hit Mozambique and two other southern African countries, Zimbabwe and Malawi. Two weeks later, as search and rescue operations wind down, the focus is shifting to feeding the survivors. Maize imports to Mozambique could double this year from the usual 100,000 tonnes, said Wandile Sihlobo, an economist with the South African agribusiness association, Agbiz. How that might impact prices is uncertain. “Food-security-wise, it’s been devastating,” the World Food Programme’s director for Southern Africa, Lola Castro, told Reuters at the airport in the cyclone-hit port city of Beira. 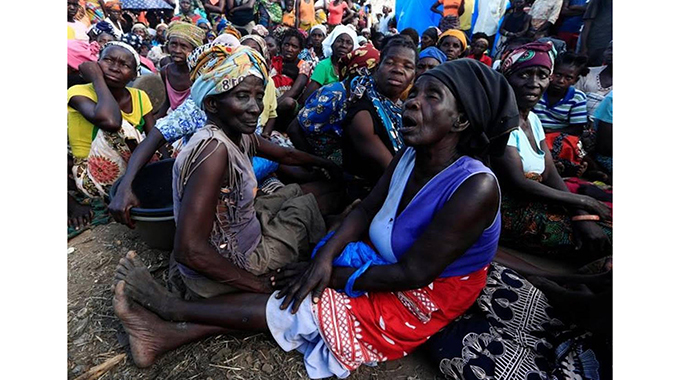 WFP has delivered food aid to some 200,000 Mozambicans and aims to reach a million in the next two weeks, Castro said. But that is not enough. Farmers also need seeds to re-plant as quickly as possible. “It needs to be done yesterday,” Castro said. The storm could not have come at a worse time, barely a month before the main maize harvest, the region’s principal crop. In countless villages, Reuters saw households desperately trying to dry green, unripe cobs salvaged from the flood waters. But villagers said eating the cobs was making them ill. In Bebedo, 100 kilometers northwest of Beira, dozens of families came out to see a Russian-made helicopter land in a cloud of dust, carrying a WFP delivery of fortified food. Within 20 minutes, they had carried more than a hundred brown boxes of Plumpy’sup, a fortified peanut paste used to treat malnutrition in young children, as well as white sacks containing a soy and corn flour blend. It was the second delivery that day. The village is being used as a distribution center to feed neighboring communities – 17,000 mouths in all. But residents said Nhampuepua, an hour and a half’s drive from Beira, was falling through the cracks. The only aid that had reached there by Saturday was donated by a local petrol company. Nhampuepua’s suffering highlights the scale of the task confronting humanitarian agencies and the government. The United Nations humanitarian coordination agency, which is overseeing the disaster response, estimates that 1.85 million people scattered across an area of 3,000 square kilometers – roughly the size of Luxembourg – were affected by the storm in Mozambique alone. The subsistence farmers of Nhampuepua, hardened by years of poverty, are already replanting what they can, using cuttings from the uprooted cassava plants that now litter the village. But the land has its rhythm and will not be rushed, however great the need. Only in eight months will the cassava be ready to eat. Until then, hunger is a real threat. On Saturday, Diniz Jeronimo, 28, and his family of five shared a bowl of plain boiled spaghetti for their only meal. Their crops were devastated. Like most of the community, the family’s only immediate income comes from selling charcoal, which takes seven days to make. On the slow, sandy road to Dondo, the nearest town, a stream of bicycles carried sacks of the fuel. Now Diniz is worried the price will come down. At the same time, the cost of food has shot up. A 25-kilogramme sack of corn flour that sold for 850 Mozambican meticais (US$13) before the cyclone now sells for 1,200 meticais, villagers said. President Filipe Nyusi, who described the storm as one of the worst natural disasters in Mozambique’s memory, said during a visit to Beira last week that 100,000 agricultural tools and 1,000 tonnes of seed for short-cycle crops would be distributed to help get farmers back on their feet. But the devastated villagers around Dondo and Nhamatanda had not received anything as of Saturday and were doubtful they ever would.